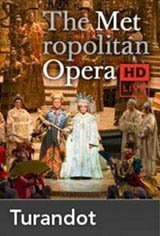 Director Franco Zeffirelli's breathtaking production of Puccini's last opera is a favourite of the Met repertoire. Maria Guleghina plays the ruthless Chinese princess of the title, whose hatred of men is so strong that she has all suitors who can't solve her riddles beheaded. Marcello Giordani sings Calàf, the unknown prince who eventually wins her love and whose solos include the famous "Nessun dorma."